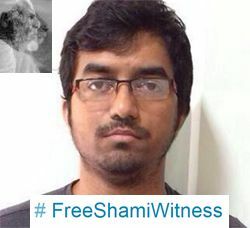 Mehdi Masroor Biswas, aka @Shami Witness, has been in custody since December 13, 2014. He was not charged until June, 2015. He has still not been tried. What's the holdup? Indian authorities are waiting on Google to respond to a subpoena. They believe Google's response will identify more accounts Biswas used to tweet out his ISIS news updates and opinions. They intend to file a second charge sheet against him with more charges. The police suspect Biswas ran multiple e-mail accounts which they could not access. “We are yet to get a response from Google. The access and information provided will help to file an additional charge sheet,” said M. Chandrashekhar, Joint Commissioner of Police (Crime). 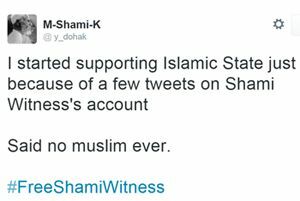 Mehdi Masroor Biswas, aka @ShamiWitness, has been charged with numerous terror crimes for his favorable tweeting about ISIS. He was arrested in December. Most of the charges carry a maximum of seven years in prison. Joint Commissioner of Police, M. Chandrashekhar said Mehdi was charged with eight sections of the Indian penal Code (IPC) including unlawful activities, conspiracy, supporting a terrorist organisation, waging war against the State, sedition and promoting enmity. The charge-sheet, containing 36,986 pages, was submitted to the Court on Monday. The Bangladore Police say they will file charges against Mehdi Masroor Biswas, aka @Shami Witness, next week. We have finally received the MHA’s approval. Now, we will file the chargesheet against him next week. We have built a solid case. We had to prove how he conspired and helped the IS. Consequently, the chargesheet is one of the longest in recent times,” a source in the Bengaluru Police said. The chargesheet is supposed to be in excess of 28,000 pages.